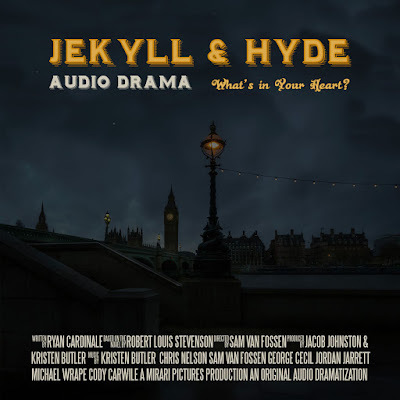 Jekyll & Hyde is an hour long audio drama adaptation of the classic novella, "The Strange Case of Dr. Jekyll and Mr. Hyde", written by Robert Louis Stevenson. This production was produced by Mirari Pictures and was directed by Sam Van Fossen, written by Ryan Cardinale, with post-production and an original score by Kristen Butler. This adaptation does a fantastic job of embellishing the themes already embedded in the original story. Jekyll & Hyde presents a vivid portrayal of the human struggle between good and evil - sin, redemption, and grace. This audio drama illustrates this struggle in a visceral way. The actors skillfully presented a convincing British accent, which when done poorly can sound stilted. Likewise, the script is written in a way that a modern audience can easily digest what the characters are articulating. Both of these things are an excellent achievement from a small production studio. The whole production is well made and entertaining, although there were a couple moments in the audio drama when the sound mixing was not quite spot on. For instance, the audio levels of the background foley and music would occasionally drown out the voices when the character was speaking in a low tone. But there is much more to praise about this audio drama. My personal favorite part of the show was Mirari Pictures' creative use of playing on the titular character's split personality. The actor who plays Hyde (Sam Van Fossen) delivers a gripping performance. Jekyll's (George Cecil) internal struggle at the climax of the audio drama makes for a very dynamic conclusion. Jekyll is a man at war with a sinful nature. And he is losing. It is quite literally taking control of his mind and body. Hyde's presence slowly corrupts Doctor Jekyll despite all he can do to fight him. The doctor cannot win in his own strength. This audio drama perfectly depicts the struggle of a man who's sinful nature has taken control of him. The curtain is lifted for a moment and we catch a glimpse of the conflict and horror going on inside a soul; like the war raging in the mind of an addict. Equally as compelling as Jekyll's internal struggle is the character of John Utterson (portrayed by Chris Nelson). He is the central good character in the audio drama, yet he is not over-idealized. In his confrontations with Hyde, Utterson nearly submits to the same kind of hatred that consumes Jekyll. His own personal loss drives him to the brink. At one point, after falling into a vengeful rage upon Hyde, Utterson says: "What have I become? The same thrust of the Enemy!" Thus even the good characters are tempted to do evil. What makes them the 'good characters' is not that there is no part of them that wishes to do wrong, but that they resist that present evil. That is what makes these characters heroic. The darkness that is present in this story - struggles against sin and the depiction of killing - is not just for dramatic effect or edginess; it is present in this audio drama because darkness is present in the real world. I believe it is necessary for maturing children to hear this kind of story. 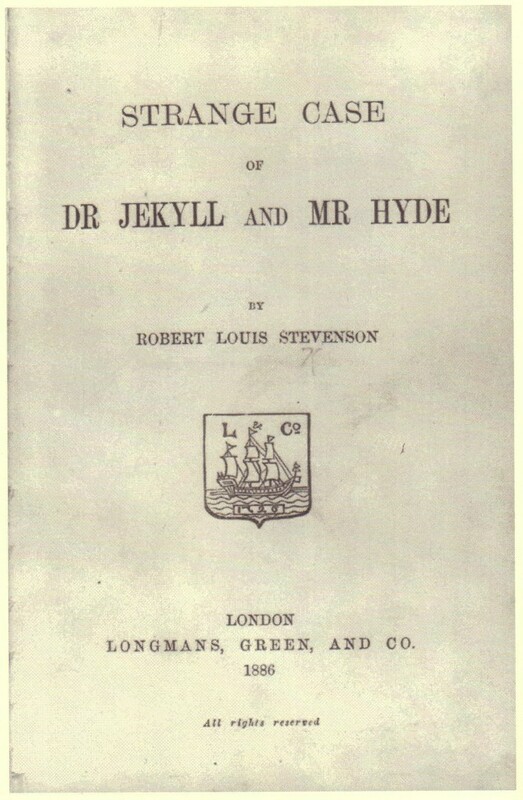 This version of the Jekyll and Hyde story shows the truth that is more often hidden from view. The darkness can be beaten. And the darkness - the true evil in the world - must be destroyed for the light to really mean something to you and I. One of my favorite quotes comes from G.K. Chesterton. 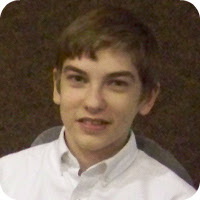 He says: "Fairy tales do not give the child his first idea of bogey. What fairy tales give the child is his first clear idea of the possible defeat of bogey. The baby has known the dragon intimately ever since he had an imagination. What the fairy tale provides for him is a Saint George to kill the dragon." All of this 'darkness' is not presented in a harsh way, however. It is presented to be suitable for most families. The audio drama is probably not suitable for the youngest of listeners because there are several murders during the story (one of which is only shown after the fact), but they are not described gratuitously. In fact, it was very necessary for this adaptation to include them. It served to advance the drama in showing the nature of the evil Mr. Hyde. And, in the end, the story is a redemptive one. So while the youngest listeners may be uncomfortable with it, anyone over the age of about 10 would be greatly benefited by listening to this audio drama. 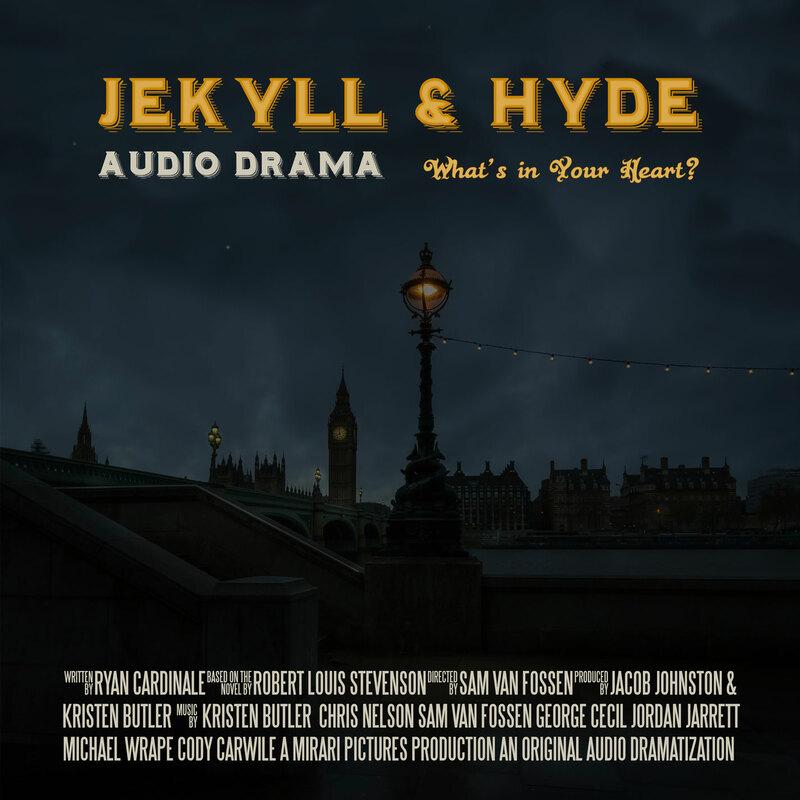 Overall, the Jekyll & Hyde audio drama is an excellent production that presents the original story in a fresh, engaging form. I look forward to hearing more from Mirari Pictures. Editor's Note: While this is certainly not the only audio adaptation or production of this story (Theater Guild on the Air produced a version in 1950), this is the only one which takes such an overt spiritual approach to Stevenson's classic. Do not go into this audio drama expecting an adaptation completely faithful to the source material. Cardinale's script is very obviously coming at the story from a specific worldview. Is that a positive or a negative? You'll have to be the judge of that.